3 cups of vegetable stock or Chaga (Click on Chaga for all of the benefits of this medicinal mushroom) We use Chaga in our recipes whenever we can. We love Chaga. Sauté garlic and onions in oil. Add remaining ingredients (Reserve Miso so it doesn’t boil) cover and simmer for 10 min. Add miso last and stir to combine. 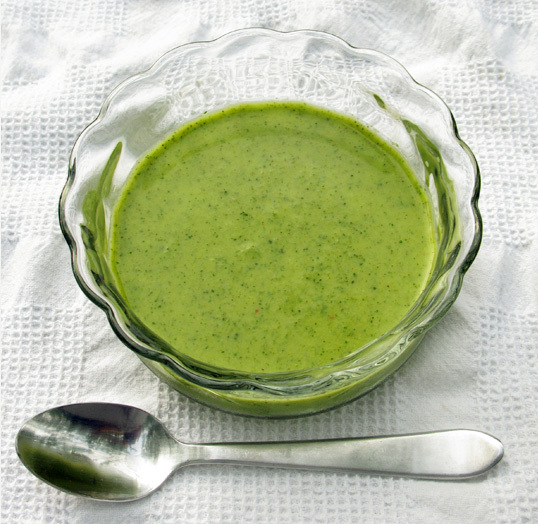 Purée soup in a food processor or high speed blender. Steam the broccoli florets as a garnish to float on top when you serve the soup. Serve for breakfast, a light lunch, as a side dish or pair with a salad or sandwich. You can really use any green vegetable here or a combination of veggies.